YITH WooCommerce Customize My Account Page helps you customize your “My Account” page in a few simple steps, adding new sections and editing the default WooCommerce ones. If you activate both plugins, it will allow you to edit the details in the “My Quotes” section ( label, icon, and content). This is the area where users can monitor the state of their quote request, directly from the plugin panel. The premium versions of the two plugins are perfectly integrated, let us explain you the process. The customer will add product(s) to the quote as usual, when the quote is created the admin can choose if the customer should pay a deposit. If the admin decides to add a deposit to the quote, he can set this option from the backend by editing the quote (WooCommerce > Orders). The admin can enable the option and set a percentage of deposit that will be calculated from the quote total. The customer will see the deposit option when he decides to accept the quote in the frontend. E.g. if the quote total is 100$ and the admin sets 15% deposit rate, the customer will have to pay only 15$ when the quote is accepted. The other 85$ will have to be paid in a second order (just like the Premium Deposit and Down payments plugin normally works). With YITH WooCommerce Minimum Maximum Quantity you can set purchase limits on the product quantity. 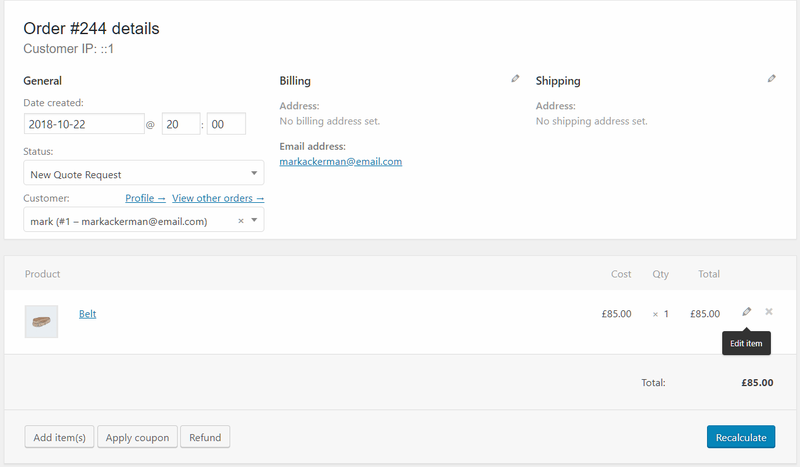 You can manage the quantity directly on the product or on the cart content. When used together with YITH WooCommerce Request a Quote, the product quantity will be managed also during the quote request phase, so that users can’t add products to the request if they do not match the restriction rules you have configured. YITH WooCommerce Multi Vendor allows you to turn your store into a multistore where vendors manage their own product and earn a commission on every sale. Thanks to the integration between these two plugins, the quote request will be forwarded to the owner of the product. Global administrators will receive the request only for products that are not related to any vendor. The vendor side orders management must be enabled as an essential condition. Every new request will be available at the “Orders” section, both on the vendor side and administrator side. For all information about the use of YITH WooCommerce Multi Vendor, please take a look at the official documentation. 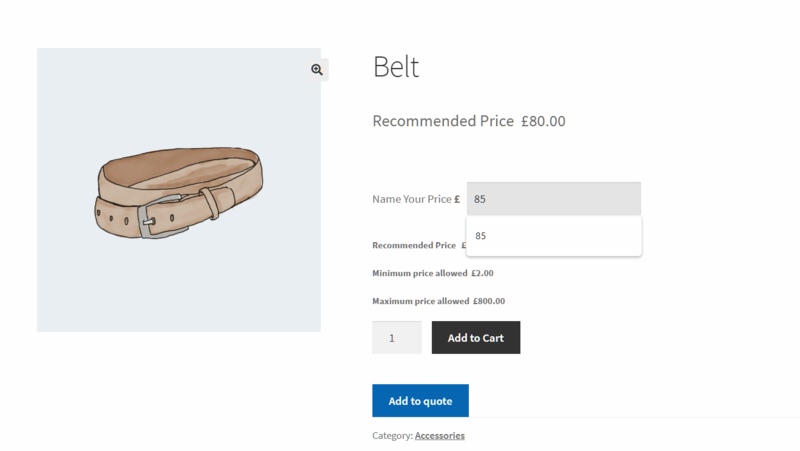 YITH WooCommerce Name Your Price allows your users to buy products of your shop at the price that they choose, if that price matches your settings. The integration with YITH Name Your Price allows your users to first set their own price for the product and then add this to the quote. The admin get the price and will make his/her offer. Just make sure both premium plugins are activated in the Plugins tab and set your preferences as explained in the plugin documentation. Now your users can set their own price on a product, and then add it to the quote list and ask for a price estimate. The admin will get the price entered by the user and will be able to confirm or edit the price and send his/her own offer. Read more about YITH WooCommerce Name Your Price on the official plugin documentation here. YITH WooCommerce Product Add-Ons allows you to configure additional options that can be added to product in your shop. For each option, it’s possible to choose a name, an image and a price, which will add up to the basic ones the product has. For more information about how to set up YITH WooCommerce Product Add-Ons, check the full documentation here. YITH WooCommerce Sms Notifications allows you to automatically send notification texts towards admin and/or users, to communicate the changed status of an order. The integration with YITH WooCommerce Request a Quote allows you to enable the SMS notifications also for all the quote statuses. After installing and activating both plugins, you need to enable SMS notifications and configure the plugin settings as described in the official documentation.